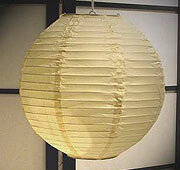 Round paper lanterns in WHITE are made of quality rice paper with even wire ribbing. 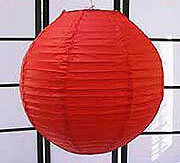 This lantern requires a single socket cord or 10-sockets electrical cord kit(multiple lanterns 12D only) Cord sold separately; please see "Lantern cord kits". 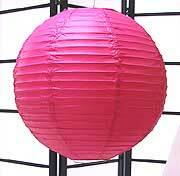 Available In: 8" D|16" D|18" D|20" D|24" D|30" D|36"
Round paper lanterns in CREAM are made of quality rice paper with even wire ribbing. 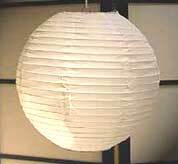 This lantern requires a single socket cord or 10-sockets electrical cord kit(multiple lanterns 12D only) Cord sold separately; please see "Lantern cord kits". 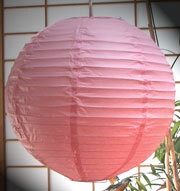 Round paper lanterns in LIGHT-PINK are made of quality rice paper with even wire ribbing. This lantern requires a single socket cord or 10-sockets electrical cord kit(multiple lanterns 12D only) Cord sold separately; please see "Lantern cord kits". 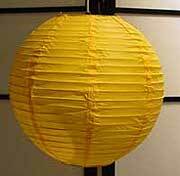 Round paper lanterns in GOLDEN-YELLOW are made of quality rice paper with even wire ribbing. 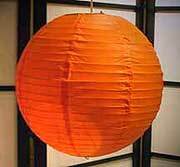 This lantern requires a single socket cord or 10-sockets electrical cord kit(multiple lanterns 12D only) Cord sold separately; please see "Lantern cord kits".